Video Seminar Instruction: 26 video lessons with a total of 8 hours of seminar-style instruction classes. Featured speakers include: Dr. Joe Vitale, Mathew Dixon, Dr. Steve G. Jones, Michael Abedin, Chuck Pennington, Dr. Mary Oz, Marissa Perks, Kit Holmes and Harry "B Happy" Bartholomew. Provided Instructional Text: Ho'oponopono Practitioner Certification Guidebook provides 8 chapters of background information, history of Ho'oponopono, modern adaptations, details, and instructions for course completion and certification. Video Seminar Instruction: 8 video lessons and a total of 6 hours and 40 minutes of seminar-style instruction introduce you to never-before- seen footage of Dr. Joe Vitale's ZERO LIMITS event featuring Dr. Hew Len and 4+ additional contributors. Following their video instruction, you'll learn the fundamentals of Ho'oponopono for private and professional practice. Bonus Audio Content: 9 audio files totaling 4 hours, derived from techniques and experiences in the videos so that you can listen to them anytime and anywhere. Certification Exam: Exam details are provided as a PDF with the course. Cost is included. 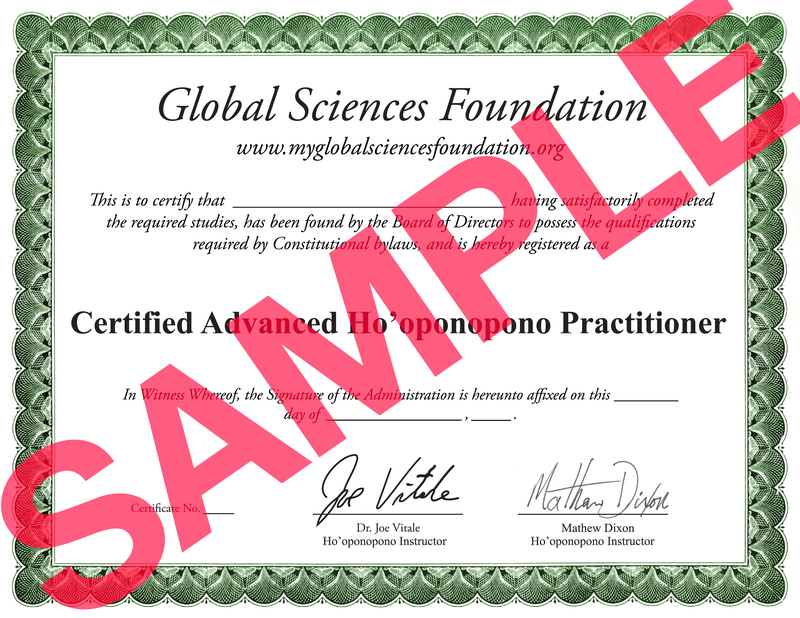 Upon completion of your training, you will be certified by the Global Sciences Foundation to practice Advanced Ho'oponopono. Dr. Joe Vitale is the author of many bestselling. Some of them include The Attractor Factor, Life's Missing Instruction Manual, The Key, Faith, Attract Money Now and his latest is a sequel to his bestseller, Zero Limits which was officially launched in January 2014, entitled At Zero. Joe has also been in several movies, including the blockbuster The Secret. He's been on the following TV shows: Larry King Live, Donny Deutsch's "The Big Idea," CNN, CNBC, CBS, ABC, Fox News: Fox & Friends and Extra TV. He's also been featured in The New York Times and Newsweek. One of his most recent accomplishments includes being the world's first self-help singer- songwriter as seen in 2012's Rolling Stone Magazine®. To date, he has released 6 albums! Several of his songs were recognized and nominated for the Posi Award, regarded as "The Grammys of Positive Music." Mathew Dixon is a world-renowned Healing musician from New Braunfels, Texas. He has produced and recorded over 12 different musical projects with Dr. Joe Vitale. Mathew owns and operates Zero Limits Music, an independent recording label that focuses on healing music and meditation. Mathew is also the author of the ground breaking book Attracting for Others. Q: Will I need any other training in order to practice Advanced Ho'oponopono besides your course? Q: Will I be properly trained if all I take is your online Advanced Ho'oponopono Certification Course? A: Ideally a Ho'oponopono practitioner would be trained in a classroom setting with an instructor physically present. Unfortunately, this luxury is not practical for many people. When we factor in airfare, hotel, time away from work and family, etc. the costs both monetary and otherwise quickly add up. For this reason, many institutions have turned to online training as a viable alternative to meeting modern day needs. In fact, Columbia, Harvard, and Cornell have extensive online programs. Also, Penn, Dartmouth, and Yale offer online classes. Additionally, in this course, you are encouraged to find a study partner and to practice your techniques on a number of people. Q: What about licensing requirements for Advanced Ho'oponopono Practitioners. Are there any? A: At this time, to the best of our knowledge, there are no licensing requirements for Advanced Ho'oponopono practitioners anywhere in the World. However, if you start a business, you will generally need a business license. A: A 'Certified Advanced Ho'oponopono Practitioner' qualified by our standards to teach and practice Advanced Ho'oponopono. Q: What do I get when I buy the Advanced Ho'oponopono Certification Course? A: You get instant access to over 8 hours of training videos and a bonus of 4 hours of audio content derived from the videos. A: You must pass the test on the database with a score of 75% or better. If you fail you have a max of 3 times to pass. If you don't pass by the third attempt, you will be locked out of makYou must pass the test on the database with a score of 75% or better. If you fail you have a max of 3 times to pass. If you don't pass by the third attempt, you will be locked out of making other attempts for 2 months. You will also need to answer an essay question. A: Upon completion of this program, you will receive a beautiful certificate sent via email, which you can print out and proudly display for your clients to see. It will have your name, title (Certified Advanced Ho'oponopono Practitioner), date of certification and your certification number. A: The program is taught by Dr. Joe Vitale and Mathew Dixon. A: Dr. Vitale has not only personally uses the power of Ho'oponopono to go from being homeless to having everything he's ever desired, he was also chosen to appear in feature films such as "The Secret" and national television shows such as The Big Idea with Donny Deutsch and Larry King Live. Additionally Dr. Vitale has authored several best selling books on this topic and remains one of the world's foremost experts on Ho'oponopono. Q: Do I need an advanced degree to practice Advanced Ho'oponopono, such as a bachelor's degree or a master's degree? A: No. In most states in the United States and in most countries, our program is all youneed. A: Yes. You will be listed on the online international list of Advanced Ho'oponopono Practitioners. Q: I have no Ho'oponopono background. Will this program actually take me from theground floor up and teach me everything I need? A: We suggest you start with the Ho'oponopono Practitioner course, then proceed by taking the Advanced Ho'oponopono Practitioner course.